I’m getting quite excited about the tutorial series as we are finally building up to something much more useful than a simple bunch of loosely connected tutorials. That something is a “2D game engine” that will allow you to create cool fast games using the Marmalade SDK that you can deploy to a bucket load of platforms simultaneously and hopefully earn an even bigger bucket load of cash from! Today we are going to begin our game engine by implementing one of the most basic components of a 2D game engine, The Sprite. From our game engines point of view, we are going to define a sprite as a visual component that can move and animate on the users screen. I wont go as far as defining a sprite as a bitmap image because our sprites are special, they can be anything we define them to be. They can be anything from a simple point, line or bitmap to something as extravagant as a vector based image. We basically want to leave our options open and offer as much extensibility to our game engine as possible. One very important point to make at this point. A sprite is only a visual component and should not be made to deal with game logic, collision detection, playing audio etc. It should only be concerned with drawing itself. Some people like this separation of concerns style programming but others (like me), whilst others do not. Erm, put down that Marmalade SDK documentation, don’t let the name fool you, you wont find this class in there. I have named the class as such so that it feels more like its part of the Marmalade SDK. CIwGameSprite is the name of our basic sprite class that we are going to base our 2D game engine around. CIwGameSprite is not actually a usable class in the sense that you can create one and do something with it. CIwGameSprite acts as a base class for other types of sprite classes and defines some basic sprite information that is going to be common to all types of sprites. Lets take a quick look at CIwGameSprite (defined in the IwGameSprite.h header file) to see what it does. We also have a few private member variables in there that deal with the transform for our sprite. We covered the Iw2D transform in our Iw2D sprite example code in a previous tutorial. Note that building transforms can be expensive in terms of time when we are rebuilding lots of them every frame, so in our sprite class we only going to rebuild the sprites transform when the sprites position, scale or angle changes (no sense doing all that work if nothings changed). Note that our Draw() method is a pure virtual method which makes the class abstract. This means that you cannot and are not supposed to create instances of this class. Instead it serves as an interface to defining classed based upon that class. Now thats said lets take a look at a class that we have derived from CIwGameSprite called CIwGameBitmapSprite. As you can see we have derived CIwGameBitmapSprite from CIwGameSprite, basically borrowing all of its functionality and then adding on some more. This class now represents a visual component that is represented by a bitmap, or in this case a CIw2DImage. SrcX, SrcY, SrcWidth and SrcHeight – These 4 variables are all inter-related. They mark a rectangular area within our source Iw2D image, which allows us to render just a portion of a large image instead of the whole thing, allowing us to use sprite sheets. If you haven’t heard of sprite sheets (or sprite atlases) then you can think of them as a collection of images arranged onto one large image. For example, you may have arranged a whole bunch of animation frames of one of your characters onto one large bitmap. This system will allow us to pick out the smaller images and render them without worrying about the rest. Ok, if you aren’t fond on collections / iterators and the likes then you probably won’t like this class very much. I will admit, i am quite obsessed with them. I find them “too” useful. I chose to use Marmalades CIwList class, which is basically a templated linked list class that lets you define a list of objects / data that is somehow related. In our case we have a list of sprites (A linked list is basically a list of objects where each object points to another and then that object points to another and so on). We can set a base transform that all of our sprites that are managed by this sprite manager are transformed by. 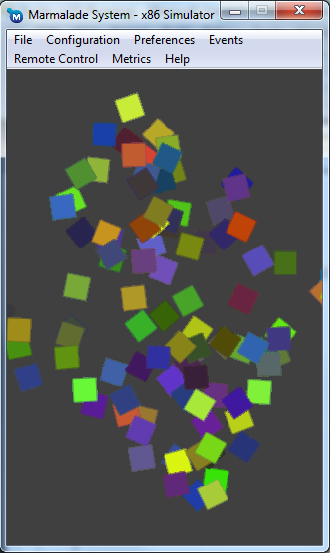 This allows us to rotate, move and scale all of the sprites in one go by the same amount. This can be great for applying effects to all of your sprites and / or simply ensuring that all sprites are scaled and translated to fit on any sized screen. We have re-used the code from our previous Audio tutorial but ripped a few bits out of the main loop to clarify what’s going on. Note that the code is a lot simpler than it looks. We are basically create 100 sprites giving each one a random position, random colour and alternative between two different bitmaps. I want to point out here that using two separate images is bad practice as the underlying Iw2D render will need to switch states continually to switch between both images. To improve performance we would combine both images into a sprite sheet and then change the rectangular area within the image for each sprite. We firstly reset our world transform using SetIdentity(), think of this as setting a variable to its default value. We then set the rotation, scale and translation that all sprites within the sprite manager will transform by. Note that we set the translation position to the middle of the screen because when we created our sprites earlier we defined their positions based around the origin being at 0,0 (top-left hand corner of screen). The world translation will move them back to the middle of the screen. We now send the world transform to the sprite manager and adjust our world angle, so everything spins. And finally before we exit the game, we delete the sprite manager which in turn deletes all of our sprites. As your projects get larger and more complex you will find that you are constantly creating and deleting many objects. The constant process of allocating and deleting objects can take its toll on the memory management system, which causes something called fragmentation. Fragmentation is when your available memory pool consists of many small chunks instead of a few large chunks. Depending on the memory management system in use, this can increase the overhead of allocating future objects and risk the chance of running out of memory even though the system is reporting plenty of free memory (this happens because there isn’t a large enough chunk of contiguous memory available to allocate). To help alleviate this problem we can pre-allocate a large number of objects in one go instead of lots of little ones at random times during the game. This is usually called an object pool. We can get around the last two problems quite easily by emptying out our constructors and destructors and putting the code into Init() and Release() methods instead. This will allow us to setup and tear down objects without every having to recreate or delete them. Also, for certain types of objects (those that need to be reset to a default state) I like to add a Reset() method which allows me to set the object back to its original state. The first problem is a lot more difficult to deal with, but the easiest solution is to simply create object pools for each type of object that you want to pool. Pooling objects is as easy as allocating a bunch of them during game boot and then using some kind of marking system to mark them as in use or not in use. Instead of creating a new object you would simply search the object pool for a object that is not in use then reset it and use it. The only thing to do is to delete the object pool before you exit your game. Well that’s it for this tutorial. Our next tutorial will handle adding frame based animations to our bitmapped sprite system which will allow us to truly walk the path of making a cool game. Hope you all find this blog useful and until next time, don’t forget, dont read my blog at the wheel!